Mountain View Personalized Address Sign - - 10.75" x 6.875" rectangle address sign complete with a mountain view panel above the address. Made in USA. 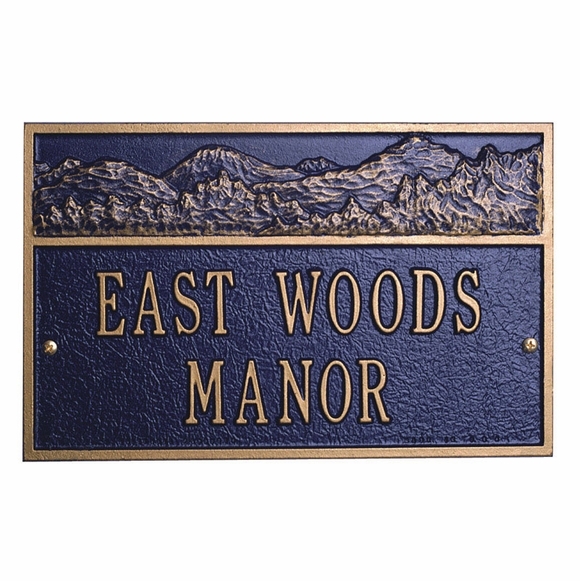 Wall mount address plaque is made to order in your choice of 16 color combinations and one or two lines of personalization. The one-line version holds up to five 3" characters. The two-line version holds up to eleven 1.25" characters on each line. If you are ordering a one-line sign, please leave the Line 2 input box empty. Decorative upper panel contains a beckoning mountain range in the distance. Mountain View Address Sign is wider than it is tall. Loved this online gift for our son's new house. It was the perfect gift and I'd tell everyone to get this as a wedding gift or a housewarming.